Whether you are training for your next big competition or just getting into martial arts, a great heavy bag is a definite must have. But with so many different brands, products and styles available, it can be hard to figure out which is the right bag for you. There are many excellent heavy bags available and we created the interactive chart below to help you find great martial arts training bags. The chart includes top bags from popular MMA brands like Everlast, Century, Outslayer, Ringside, Title and more. You should also read through some of the reviews on this site so that you can select the best bag for your training needs. Click here to check out the full guide of over 30 bags! 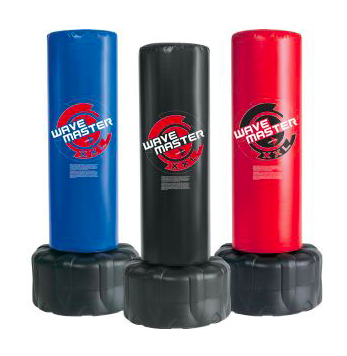 The Century Wavemaster XXL is definitely our favorite free standing heavy bag and the top bag we recommend for home use. The bag is well made, durable, and provides a great forgiving experience even with power punches and kicks. The XXL is actually an enhanced version of the original Century Wavemaster. While we like the original and think it’s a solid choice for people on a budget, for some people it’s a little too small or it doesn’t have enough padding. The XXL improves on the original’s design by increasing both the size of the bag and the padding significantly. The bag is 18 inches thick and stands at 69 inches tall, so there is a very large striking surface. This makes the bag great for practicing punches, kicks, knees, elbows and more at different height levels. The bag weighs about 270 pounds when the base is filled (you can use sand or water). It has a vinyl cover, which feels great when hitting it. The foam layer that covers the top portion of the bag should provide ample protection when striking it even with power punches and kicks during your heavy bag workout. 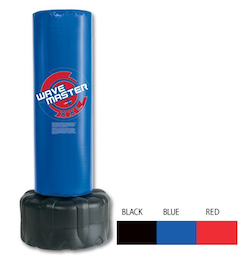 Due to the bag’s versatility, we recommend the XXL to both cardio users and mixed martial arts fighters. 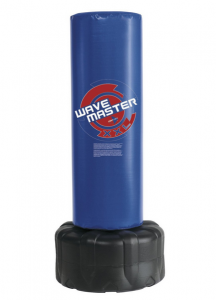 If you are in the market for a high-quality heavy bag then you should definitely check out the Wavemaster XXL. 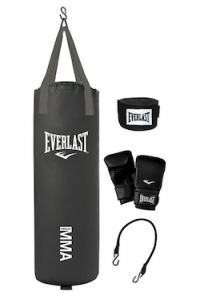 Another popular punching bag that we recommend is the Everlast Kit. This kit comes with a 70 pound bag, gloves and hand wraps. If you are on a budget then this kit is a great choice as you get everything you need to start training at a very affordable price. The bag itself is filled with fiber and sifted sand and provides very good shock absorbency from punches and kicks. The bag itself is on the little lighter side, so if you are heavier (more than 160 pounds) or are looking to develop power then you probably want to consider a heavier bag. However, for many users this bag is perfectly fine and can be used until you are ready for a bigger one. You can see our chart of over 30 bags here for heavier options. The bag has an adjustable chain that can be used for different height settings. It also comes with a bungee cord that can be used to increase the resistance of the bag. If you are looking for good starter bag then you should definitely read the reviews to find out more. There are two kinds of bags that most people choose from: hanging bags and free standing bags. Both have their advantages and you should choose the kind that is most suitable both for your training needs and the martial arts style you plan to practice. Muay Thai bags are always hanging bags, but they are different than the traditional kind of bag. 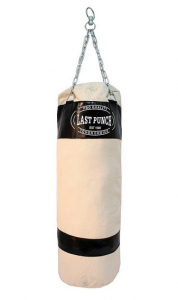 The key thing to note is that there are many great punching bags in all the different styles, so we encourage you to choose the kind that you like the best. Hanging bags are usually suspended from the ceiling by a chain. They can also be mounted to a wall or you can get a specially designed stand if your ceiling won’t support the weight or there isn’t enough space. Once the bags are connected to a ceiling or wall they can’t be easily moved, so if you buy a hanging bag you should be committed to keeping it in the same place for a long time. Hanging bags have a couple of important advantages. First, bags that hang tend to swing a little when you hit them. This allows you to work on your timing, speed and accuracy, which provides a more realistic workout experience. Second, the weight is positioned better in hanging bags compared to the free standing kind, and this will help you work on techniques that develop your power more easily. If you don’t have a set space for a hanging punching bag, then a free standing bag is a good option to consider. You can put a free standing bag anywhere there is space and most are relatively easy to move around, which means you can move it out of the way when you’re done with it. The base of the bags usually keep them pretty sturdy, which makes this kind of punching bag is good for both kicks and punches. Free standing bags can also be placed on the floor and can be used for a great ground and pound workout that involves knees, elbows and other strikes. It can also be used for grappling training. However, their weight distribution is different than a bag that hangs and they tend to dance around a little more, which some people don’t like. If you punch the bag it will probably be fine, but a hard kick on some bags may make them wobble a little too much. One other issue with free standing bags is that some of them don’t have enough thick padding and if you hit it too hard you can feel the base (check out our Wavemaster XXL Training Bag Review for a great bag with a lot of padding). Muay Thai bags are significantly longer and skinnier than traditional bags. They were specifically designed for Muay Thai training (and not MMA), which features a lot of leg kicks. However, many people like to use them for other kinds of martial arts training, so whether to get this kind of bag really depends on your training. If you plan on using your bag for mostly for kicks than a Muay Thai bag is a great option. Since it’s very long (around 6ft for most bags) it is great for both low and high leg kicks and knees. However, if your focus is on boxing or a mix of punching and kicking then you probably want to stick with a traditional bag instead of a Muay Thai bag. Muay Thai bags are also much heavier than traditional punching bags and are often more expensive due to the increased length and material necessary to make them. One of the biggest questions people ask us is what weight bag they should get. There aren’t any hard set rules, but generally the rule of thumb is to get a bag that is around half your weight. Of course these guidelines should be used roughly as there probably won’t be a bag that is exactly your weight. Generally the 40-50 pound bags are meant for kids or lighter women. The 70-80 pound bags are geared toward people up around 170 pounds. If you weigh more 170 pounds then you probably want to consider bags closer to the 100 pound mark or over. The bag weight also depends on experience and power. If you have been practicing for a long time and have powerful strikes you may want to consider using a heavier bag. This is because when you hit a bag it tends to move and sway. Some movement is natural and it actually lets you practice your speed and timing. However, too much movement isn’t good and can make it annoying to use an MMA bag. So if you have powerful punches you probably want to consider a heavier bag so that it will be more sturdy. Free standing: This kind of bags have listed weights much higher than regular hanging bags because they include the weight of the base. However, the actual bag portion itself doesn’t weigh that much and most respond similarly to a normal weighing hanging bag, so don’t be thrown off by the total listed weight. Muay Thai: Muay Thai bags are longer than traditional training bags and as a result weigh more. Also, a Muay Thai heavy bag is meant primarily for kicking, which is more powerful than punching, so more weight is needed to stabilize the bag. Many people feel fine with the 100 pound Mauy Thai bags, but if you weigh more, have powerful strikes, or are experienced you may way to get a heavier bag. There are many types of materials used in the filler of the best punching bags and each one provides a slightly different experience. The most common bag fillers are sand, water, shredded fibers and compressed fabric. Some bags may also use a combination of a couple different fillers. Many bags will also use come with a foam internal layer (occasionally it’s an external layer). For some of the cheaper bags, people sometimes use things they have lying around like old clothes and rags. If you don’t access easy access to the normal bag fillers you can do that, but we suggest sticking with bags that come pre-filled with standard materials or adding the standard fillers yourself. All the main filler materials have their advantages and disadvantages, which we explain in more detail below. Some bags used shredded fibers or compressed fabric. These bags are designed to provide a similar experience to sand; however, they don’t usually have the same issue with the materials settling on the bottom. This means that they are nice to use as they provide an even resistance throughout the whole bag. As mentioned above, some bags use a mix of sand and fiber or fabric to help avoid the settling issue. Sand is probably the most commonly used material to fill heavy bags. Sand bags tend to be heavier than bags with other materials, so if you are looking for a heavier bag then you will want to consider using sand. Sand is a good filler because it generally provides a consistent resistance experience. Sand punching bags also aren’t affected by temperature like water and are more weatherproof (i.e. if you have it outside during winter it won’t freeze). Another major advantage of sand is that if the bag ever springs a leak it’s usually pretty easy to clean up and buy replacement material. One disadvantage to sand is that the bags can settle a little, which means the lower portion of the bag may be harder than the top. Some sand bags use either a foam layer or are mixed with shredded fiber or compressed fabric to help mitigate this issue. Water is also very commonly used to fill up heavy bags and it has a lot of great features. Many people like to use water filled bags because it provides a realistic striking experience . Water bags tend to mimic the effects you would get if you were competing against a real person more so than other materials. Water also provides an even resistance experience throughout the entire bag, so you don’t need to worry about certain parts of the bag being harder or softer. This also means you don’t need to worry as much about injury your joints or other parts of your body when hitting the bag. Another key advantage to water based bags is that they can be unfilled and moved around much more easily than other materials. If you think you’ll need to move your bag around then we strongly suggest you consider a water bag. One disadvantage to water bags is that if they break they can cause a huge mess and be difficult to clean up. 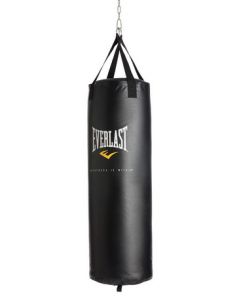 One of the biggest contributors to punching bag cost is the material the bag is made from. There are several different materials that most bags are made from and each has their own advantages and disadvantages. The three most popular materials for bags are leather, vinyl and canvas. We personally prefer leather bags, but we’ve used them all and below we explain the different materials in more detail. Then there is the Body Opponent Bag that is shaped like a human and is a great bag, but doesn’t really fit into any of these categories. You can see our Body Opponent Bag (BOB) review here. Leather is a popular choice for premium martial arts bags. When hitting it (especially with punches), it has a great natural feel and definitely provides a better premium striking experience when compared to other materials. Many people who like to punch without gloves prefer leather bags because it doesn’t cut up their knuckles like other materials sometimes do (we still always recommend using gloves though). Leather also tends to last longer than bags made from other materials and has a very high durability level. There aren’t many cons to leather bags, but the top one that most people mention is that they are usually more expensive than vinyl or canvas bags. Vinyl bags are made to feel similar to leather in both look and feel and they can be a good choice. Many people have vinyl bags and we’ve use many great ones before. However, the quality of vinyl liner usually doesn’t often quite match up to the liner you’ll get from a leather bag. Of course the major advantage to vinyl is that you likely can buy one for cheaper than a similar quality leather punching bag are they are usually quite durable. Vinyl bags are probably the most popular kind of MMA bag due to the combination of decent price and good build quality. Canvas bags are usually lower quality punching bags. The feeling from hitting them is definitely subpar compared to leather and vinyl. However, they are often much cheaper than leather and vinyl bags, which can be a big advantage if you don’t have a lot of money to spend. Besides costs, canvas bags can also handle getting wet much better than leather or vinyl bags. If you want to put a bag in a place that is exposed to the elements (like in your yard) then a canvas bag could be a good cheap option. One thing to note is that we strongly recommend you plan on using gloves with a canvas heavy bag, especially for boxing training. Canvas can cut up your knuckles after repeated punches (especially if you hit it on the seams with your fists) and gloves will help solve this issue. Durability with canvas bags is another one of the major cons when people discuss canvas bags. *Specifications and availability from the items listed on this page are based on Amazon.com and/or other sources. Please make sure to confirm the specifications and availability as details may have changed.